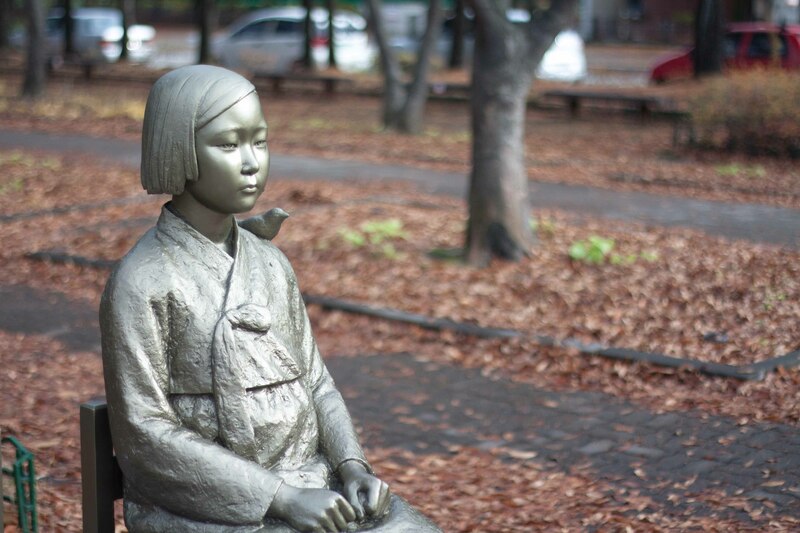 Local universities are unwilling to approve students’ requests to place statues of girls symbolizing Korean victims of sexual slavery on their campuses out of concerns that it may discourage their attempts to attract Japanese students. According to students at Kookmin University, Wednesday, an intramural community, comprised of 20, has sought to erect a statue since April, raising 16 million won ($14,000). It was due to be completed Nov. 3 to mark the anniversary of the Gwangju Student Independence Movement that took place in 1929 to protest Japanese colonial rule. However, the school office has put a damper on the plan out of concerns that it could derail its pursuit of globalization. “The school needs more international exchange students and research activities, but building a statue on the campus may trigger problems with a specific country,” said Kim In-jun, dean of the Office of Academic Affairs at Kookmin. His remarks came after a student asked him via email about whether the school will approve it. However, as Kim’s comments drew a controversial response, the school reversed its position, saying the previous stance was the dean’s personal opinion. “If students officially submit an application to place the statue on campus, the school will formally discuss it,” the university said. Kookmin has become the latest school here to disapprove of having the statue on their campus. In March, a civic group attempted to install a statue at Hongik University, but the plan was thwarted by the school office and students. Eventually, the statue was placed in front of Mapo Central Library. “Setting up a sculpture which offends the people of a specific country on the campus is an act harmful to our efforts toward globalization,” Hongik University said at the time. Also, students of Busan-based Dong-A University and Chungnam National University in Daejeon have been striving to install statues, but to no avail due to opposition from the school authorities. The biggest sticking point in erecting a statue on campus is that many schools maintain sisterhood relationships with Japanese schools. In that respect, should schools accept such a statue, they may have difficulty recruiting more Japanese students — a practice emerging as a new cash cow for local schools. On the other hand, Daegu University placed such a statue on its campus last December, becoming the first to do so. The sexual slavery issue has long been a source of disputes between Korea and Japan as Tokyo flatly denies any coercion in mobilizing the women, calling them voluntary prostitutes. In response to Japan’s “flawed” perception of history, a Korean civic group erected the first statue depicting an unsmiling young girl in front of the Japanese Embassy in Seoul in December 2011.